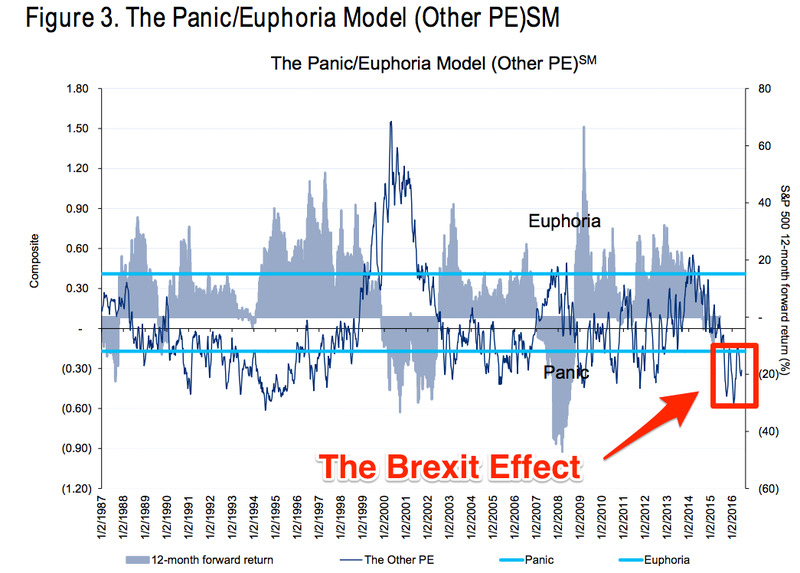 The growing possibility that the UK could leave the European Union is sending panic throughout the markets. As polls began to show a swing towards a Brexit at the start of the week, the FTSE crashed below 6,000 and the VIX, a measure of financial volatility known as the fear index, shot up from around 13 to more than 20. It is even pushing bond yields to unprecedented lows as investors seek a safe haven from more jumpy assets such as stocks. Yields on Germany’s sovereign debt into negative territory for the first time on Tuesday, meaning investors are willing to actually pay to hold German government debt rather than receive any return. While there are concerns for the UK economy — UK Chancellor George Osborne said a Brexit would leave a £30 billion ($43 billion) budget hole — the markets are telling us something bigger, according to analysts at US bank Citi. Brexit might just be the start of a general unravelling of the EU. In our opinion, investor sentiment is the factor that could be most disrupted by a vote for Brexit, especially if the Street begins to worry about more votes across the pond that generate deeper concerns about economic trends that can become more global in nature. Market participants do not like uncertainty and thus focusing on sentiment is more useful. 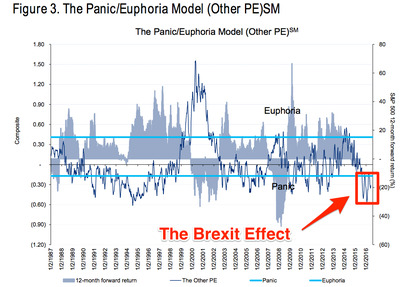 As seen in Figure 3, “panic” readings are already evident and risk premiums are high already. But it is not just investor sentiment that could hurt markets. As political risk weakens the pound and the euro, the dollar would strengthen, making US companies less competitive overseas and lowering earnings. Furthermore, the dollar’s relative weakness in 2016 has been important for broader 2H16 S&P 500 EPS expectations and thus a strengthening of the buck would imply that downward earnings pressures could be revived and act as a new restraint on share prices. Accordingly, a Leave vote must be considered a significant risk for the US market in terms of a potential correction but it is also unlikely to cause a bear market on its own.